The leader of the opposition Jumhooree Party (JP) Gasim Ibrahim has announced he will retire from politics once his five-year term as Maamigili MP expires in 2019. The philanthropist and tourism tycoon, who contested the 2008 and 2013 presidential polls, told newspaper Haveeru today that he plans to resign as the JP leader. He also said he no longer wants to run for the presidency. “My experiences of the two [presidential] elections I’ve contested are clear. It has damaged my businesses. Now I want to step down and serve the people. There is a lot I can do to serve. I have served many people for the sake of humanity,” he said. Gasim’s announcement comes weeks after the government slapped a US$90.4million fine on his Villa Group and froze the accounts of several subsidiary companies. The claim was issued after the JP split from the ruling coalition and allied with the main opposition Maldivian Democratic Party (MDP) in a campaign against President Abdulla Yameen’s alleged authoritarianism. The JP is meanwhile in disarray with two senior officials facing terrorism charges. Gasim is in Germany at present, Haveeru said. He has been abroad since late April. In a tweet in May, he said he was in Thailand. Gasim on Tuesday also appealed to the 10-member JP parliamentary group to support a ruling coalition-proposed constitutional amendment that would bar him from the presidency. “The JP’s constitution states the leader of the party is its presidential candidate. I fill that position today. But with my decision to support that [the constitutional amendment] I cannot hold that position. So I will hold a congress and hand over the leadership to someone else,” he said. The ruling coalition wants to set an age limit of 30 to 65 years for the presidency. The constitution at present says that presidential candidates must be 35 years of age. Gasim will be 66 in 2018. The JP is currently the only opposition party in talks with the government. The JP’s last-minute backing was key in President Yameen’s 2013 presidential win. 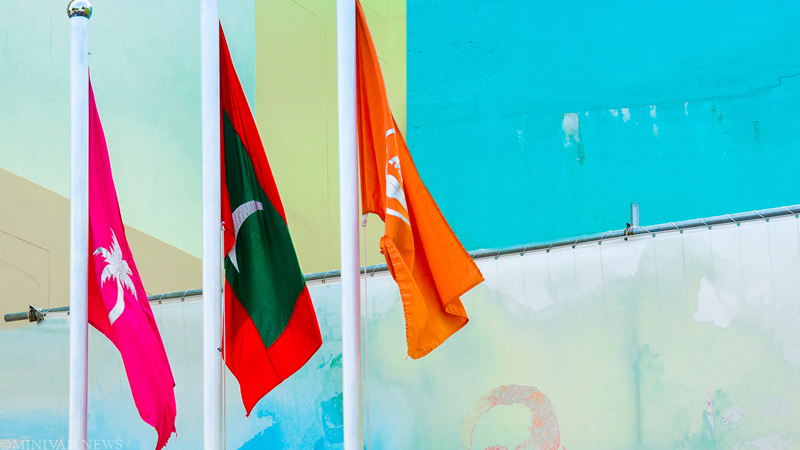 The ruling Progressive Party of the Maldives (PPM) and the JP formed a coalition government, but tensions arose within months after JP accused the ruling party of failure to honor provisions in the coalition agreement including awarding JP members’ jobs. Gasim had also backed ex-president Mohamed Nasheed in 2008 against the president of 30 years, Maumoon Abdul Gayoom. The JP and Nasheed’s MDP had formed a coalition with several smaller parties, but the coalition, too, fell apart within its 100 days. Gasim went on to play a key role in Nasheed’s 2012 ouster. According to Haveeru, Gasim is in Frankfurt to save his ailing company. The Villa Group – which operates businesses in shipping, import and export, retail, tourism, fishing, media, communications, transport and education – has faced difficulties in paying its 5000 staff due to the tax authority’s decision to freeze company accounts. The Villa Group is contesting the US$90.4million claim at the civil court. The claim has cost the company a US$80million loan, Villa has said. “We are in dire straits, unable to pay salaries. With the accounts freeze, we are facing difficulties in sending money to students we provide scholarships for. Tourism occupancy is also very low. So I am looking for ways to improve the company’s financial situation,” Gasim said. The Villa Foundation is currently supporting some 350 students’ higher education in the Maldives and abroad. The foundation says it has provided some 5000 students with full or partial scholarships. Since the tax authority issued the US$90.4million claim, Gasim has not been seen at opposition protests and has remained silent on the ongoing political crisis triggered by the jailing of several politicians including Nasheed. MPs and senior officials of the JP, however, went on to form a new coalition with the MDP and the religious conservative Adhaalath Party in March. Gasim served as Minister of Finance from 2005 – 2008 and served as the Speaker of the special parliament set up to draft the Maldives’ new constitution in 2008. The ruling coalition is planning to celebrate Saturday’s council by-election victories with fireworks in Malé tonight. The fireworks display is due to take place around 8:30pm at the artificial beach. According to provisional results from the Elections Commission, Progressive Party of Maldives (PPM) candidate Abdul Mufeed won the by-election in Haa Alif Muraidhoo for a vacant seat on the island council with 208 votes (45.41 percent) whilst his closest contender, independent candidate Mohamed Fuwad, received 143 votes (31.22 percent). Opposition Maldivian Democratic Party (MDP) candidate Aishath Visama received 107 votes (23.36 percent). In the contest for the Meedhoo constituency seat on the Dhaalu atoll council, Maldives Development Alliance (MDA) candidate Mohamed Mamdhooh secured 997 votes (60.94) against MDP candidate Salim al-Sabah with 639 votes (39.06 percent). The Meedhoo constituency is represented in parliament by MDA leader and resort tycoon, MP Ahmed Siyam Mohamed. Voter turnout was 70.25 percent in Meedhoo and 80.56 percent in Muraidhoo. Speaking at a press conference last night following the announcement of the by-election results, Tourism Minister Ahmed Adeeb declared President Abdulla Yameen would win re-election in one round of voting in 2018. Adeeb said the victories for PPM and coalition partner MDA candidates showed the government’s support was not 25 percent as the opposition claims. A majority of the public was behind the current administration and supported its policies, he suggested. “We will show results through the ballot box,” said the PPM deputy leader, condemning the opposition’s ongoing nightly anti-government demonstrations. After former coalition partner Jumhooree Party (JP) withdrew support for the government and formed an alliance with the MDP last month, the opposition has contended that the current government lacks legitimacy and does not have a popular mandate to govern. In the cancelled first round of the 2013 presidential election, PPM candidate Yameen polled 25 percent. After polling 29.72 percent in the first round re-vote, Yameen won the second round run-off against former President Mohamed Nasheed after the JP decided to form a coalition with PPM. JP Leader Gasim Ibrahim finished third place in the re-vote with 23.43 percent and endorsed Yameen after initially declaring he would remain neutral. Adeeb meanwhile noted last night that the ruling coalition won the recent by-elections after the JP left the coalition. Street protests could neither produce results nor weaken the government, he said. The nightly protests were also adversely affecting local businesses and causing disruptions in the capital, he added. Adeeb also slammed former ally Adhaalath Party (AP) for joining the opposition campaign, contending that its leaders have “betrayed” the religious conservative party’s members. “GMR is now OK, Denmark is also OK [for AP leaders],” he said, referring to AP President Sheikh Imran Abdulla spearheading nationalistic protests calling for the cancellation of the Indian infrastructure giant’s agreement to manage the international airport and the party’s allegations that former President Mohamed Nasheed pursued anti-Islamic policies. At a press conference last week, Adeeb said the AP’s leaders have made “a career” out of toppling governments. Adeeb also claimed that the ruling coalition has won six out of eight by-elections held since the 2013 presidential election. However, 12 council by-elections have been called since the presidential poll, half of which were won by opposition candidates. In several by elections, opposition candidates won by default as the ruling coalition did not field candidates. If there’s an election, it’s won by PPM or MDA. Therefore, we must have fireworks in Malé tomorrow, PPM PG Leader Ahmed Nihan said. All are invited. We secure results from the ballot box, a PPM supporter said.